Ahmose I (Egyptian: Jˁḥ ms(j.w), sometimes written Amosis I, "Amenes" and "Aahmes" and meaning Born of Iah ) was a pharaoh of ancient Egypt and the founder of the Eighteenth dynasty. He was a member of the Theban royal house, the son of pharaoh Seqenenre Tao and brother of the last pharaoh of the Seventeenth dynasty, King Kamose. 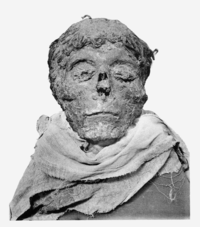 During the reign of his father or grandfather, Thebes rebelled against the Hyksos, the rulers of Lower Egypt. When he was seven years old his father was killed, and he was about ten when his brother died of unknown causes, after reigning only three years. Ahmose I assumed the throne after the death of his brother, and upon coronation became known as Neb-Pehty-Re (The Lord of Strength is Re). The name Ahmose is a combination of the divine name 'Ah' (see Iah) and the combining form '-mose'. During his reign, he completed the conquest and expulsion of the Hyksos from the delta region, restored Theban rule over the whole of Egypt and successfully reasserted Egyptian power in its formerly subject territories of Nubia and Canaan. He then reorganized the administration of the country, reopened quarries, mines and trade routes and began massive construction projects of a type that had not been undertaken since the time of the Middle Kingdom. This building program culminated in the construction of the last pyramid built by native Egyptian rulers. Ahmose's reign laid the foundations for the New Kingdom, under which Egyptian power reached its peak. His reign is usually dated to the mid-16th century BC. 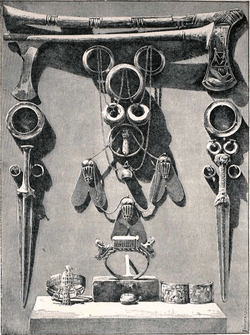 For more details on this topic, see Family tree of the Eighteenth dynasty of Egypt. Ahmose descended from the Theban Seventeenth Dynasty. His grandfather and grandmother, Senakhtenre Ahmose and Tetisheri, had at least twelve children, including Seqenenre Tao and Ahhotep. The brother and sister, according to the tradition of Egyptian queens, married; their children were Kamose, Ahmose I and several daughters. Ahmose I followed in the tradition of his father and married several of his sisters, making Ahmose-Nefertari his chief wife. They had several children including daughters Meritamun B, Sitamun A and sons Siamun A, Ahmose-ankh, Amenhotep I and Ramose A (the "A" and "B" designations after the names are a convention used by Egyptologists to distinguish between royal children and wives that otherwise have the same name). They may also have been the parents of Mutnofret, who would become the wife of later successor Thutmose I. Ahmose-ankh was Ahmose's heir apparent, but he preceded his father in death sometime between Ahmose's 17th and 22nd regnal year. Ahmose was succeeded instead by his eldest surviving son, Amenhotep I, with whom he might have shared a short coregency. The conflict between the local kings of Thebes and the Hyksos king Apepi had started during the reign of Seqenenre Tao and would be concluded, after almost 30 years of intermittent conflict and war, under the reign of Ahmose I. Seqenenre Tao was possibly killed in a battle against the Hyksos, as his much-wounded mummy gruesomely suggests, and his successor Kamose (likely Ahmose's elder brother) is known to have attacked and raided the lands around the Hyksos capital, Avaris (modern Tell el-Dab'a). Kamose evidently had a short reign, as his highest attested regnal year is year 3, and was succeeded by Ahmose I. Apepi may have died near the same time. The two royal names—Awoserre and Aqenienre—known for Apepi attested in the historical record were for the same Hyksos king that were used by Ahmose's opponent at different times during the latter king's reign. 1 2 3 4 5 Clayton (2006) p. 100. 1 2 3 Wiener and Allen (1998) p. 3. 1 2 Shaw. (2000) p. 199. 1 2 Grimal. (1988) p. 192. 1 2 Grimal. (1988) p. 194. 1 2 Grimal. (1988) p. 190. ↑ Dodson. (1990) p. 91. 1 2 3 Wente (1975) p. 271. ↑ Redford. (1965) p. 28. 1 2 3 4 Grimal. (1988) p. 193. ↑ Shaw. (2000) p. 203. 1 2 Redford. (1992) p. 71. ↑ Ahram (2005) Accessed August 23, 2006. ↑ Redford. (1967) pp. 46–49. 1 2 Redford. (1992) p. 195. 1 2 3 4 Maspero, Gaston. History Of Egypt, Chaldaea, Syria, Babylonia, and Assyria, Volume 4 (of 12), Project Gutenberg EBook, Release Date: December 16, 2005. EBook #17324. ↑ Shaw. (2000) p. 209. ↑ Shaw. (2000) p. 213. ↑ Rice. (2001) p. 3. 1 2 Catalogue Général 34001, Egyptian Museum, Cairo. 1 2 Quarry Inauguration, accessed July 28, 2006. 1 2 Edna R. Russman et al. Eternal Egypt: Masterworks of Ancient Art from the British Museum, pp. 210–211. 1 2 3 4 Gordon, Andrew H. A Glass Bead of Ahmose and Amenhotep I. p. 296. Journal of Near Eastern Studies, vol. 41, no. 4, October 1982. ↑ Shaw. (2000) p. 208. ↑ Shaw. (2000) p. 210. ↑ Egyptian Pharaohs: Ahmose I, accessed July 19, 2006. ↑ Ahmose Pyramid at Abydos, accessed July 22, 2006. 1 2 Lehner, Mark. The Complete Pyramids, p. 191. Thames & Hudson Ltd, 1997. ↑ Wente (1975) p. 272. ↑ Redford. (1967) p. 51. Dodson, Aidan (1990). "Crown Prince Djhutmose and the Royal Sons of the Eighteenth Dynasty". The Journal of Egyptian Archaeology. University of Chicago Press. 76: 87–96. doi:10.2307/3822009. JSTOR 3822009. Wente, Edward F. (1975). "Thutmose III's Accession and the Beginning of the New Kingdom". Journal of Near Eastern Studies. University of Chicago Press. 57 (1): 265–272.